Buying office plants or a desk plant capable of thriving in low light conditions is an easy way to purify the air, improve your mood, and add beauty and grace to an otherwise bland office space. And you don't need a green thumb to grow one of the beautiful potted plants on our list of the 5 best office plants. These hardy desk plants can thrive in well-lit, and dim work spaces, and can handle neglect if you travel a lot for work, forget to water them, or simply have a "black thumb." They Purify the Air - A study by NASA of their SkyLab structure identified 107 dangerous VOCs (Volatile Organic Coumpounds) in the air of the work-space, which were having a negative effect on the health of workers. After introducing plants to the environment, the air was re-tested, and most of the harmful VOCs had been removed from the air. They Reduce Stress - Helen Russell, in her Master's Dissertation in Environmental Psychology at Surrey Univiersity studied 3 biological stress indicators on a set of people who took a difficult test in a room filled with plants, and on a second set of people who took a difficult test in the same room but without the plants. The study showed that the group surrounded by plants had a much lower stress level. They Will Make Your Office More Comfortable - Most offices fall short of the 30-60% humidity level which is ideal for humans according to Washington State University, but adding office plants or desk plants to your work space can create a more comfortable environment by improving the humidity level. They Can Make You More Productive - A Washington State University study reported that live indoor plants could help workers achieve improved focus and complete their work with more efficiency. They're Good for the Soul (and Planet) - Not only can tending a plant regularly feed the health and well being of the person who does it, but it can also serve as a reminder of the important role we all have in taking care of the environment, leading you to make more eco-conscious decisions throughout your day. 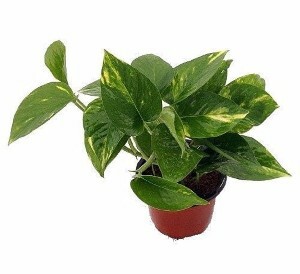 Golden Pothos, also known as Devil's Ivy or Epipremmum is one of the most versatile and easily grown indoor plants. It thrives as a potted office plant, can adapt to a variety of light conditions, and is hardy if neglected. Provide a pot with good drainage and water weekly for best performance. 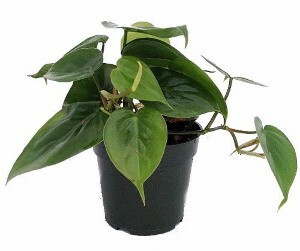 Pothos is available in most local greenhouses, and can be ordered from Amazon for a couple of bucks. While any spider plant will thrive in an office setting, The Ocean Spider Plant is my favorite, as it features more white on its leaves and off-shoots and charming white flowers, creating beautiful contrast with the natural green color of its leaves. 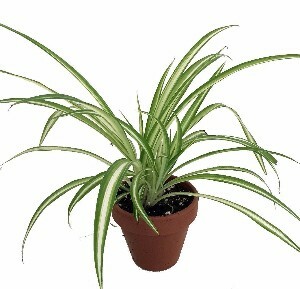 Spider plants will do well in partial sunlight, or under bright artificial lights, but you should not place them in full sun (this can burn their delicate leaves). Fertilize very sparingly as too much fertilizer will limit their production of attractive off-shoots (which will hang from the plant like little spiders). 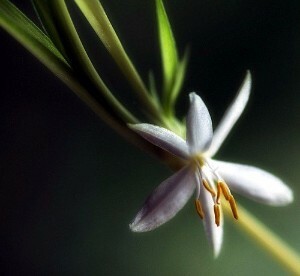 Most garden centers will sell spider plants, and the Ocean Spider Plant can be ordered from Amazon for a few dollars. 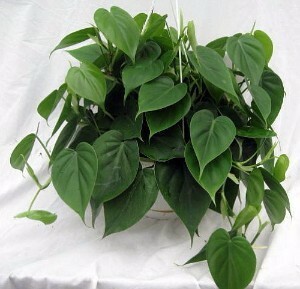 Some people may confuse the Goldent Pothos with this beautiful Heart Leaf Philodendron. Both offer beautiful, vibrant green leaves, and both plants are very easy to care for (they sometimes do better when you neglect them!). I recommend re-potting in a 2" larger pot than it comes in. Choose a clay pot with a drainage hole, and water sparingly once every 7-10 days. Any place in your office will do, but avoid full sun. Full sunlight and too much water are really the only ways you can possibly kill this air-purifying office plant. It's available for purchase from Amazon and can also be found at most local nurseries or garden centers. Want to make a statement with an office plant (even if you have a black thumb)? 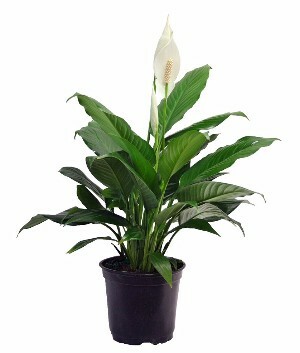 Buy a Peace Lily, which will purify the air in your office while adding beauty and a lovely subtle fragrance. Big, lush leaves and graceful white flowers (when in bloom), make this an easy choice for workers who want to add drama and beauty to their work space. The only thing you really need to know about caring for your Peace Lily is that you should avoid direct sunlight at all costs. They love the shade, and their leaves will brown with too much sunlight. That's one reason why they're perfect for offices with little sunlight, or indirect sunlight. Find your peace lily at your local garden center, or order this one in a 6" planter's pot from Amazon. 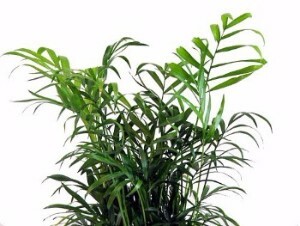 This beautiful Parlor Palm is one of the hardiest and most popular indoor varieties of palm, which has made it a staple in many office settings. It is drought tolerant (for the forgetful), grows well in low light, and can put up with neglect and abuse without missing a beat. Your local garden center may have some in stock, but I ordered mine online and was really happy with the plant I received. It's in the corner of my office, and has done well there. Most plants that you purchase will be 12-18 inches in height, but they will grow to a few feet if you re-pot them to a larger growing container. 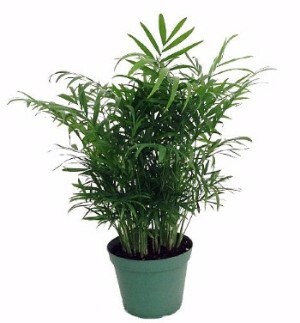 This makes the Parlor Palm a great choice for office of any size (keep it in a small pot and it will remain small). Of course if you're having trouble making up your mind (or want a collection of great air-purifying office plants), you can dive in and buy three or four. 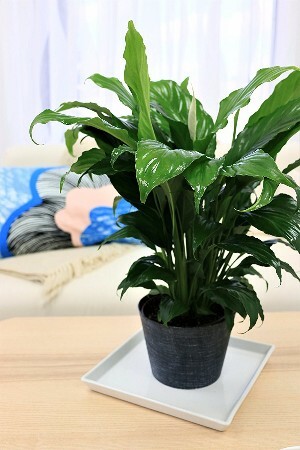 For beginners I love this group (pictured) of 4 indoor air-purifying office plants which you can order online as a set to be shipped directly to your home or office. 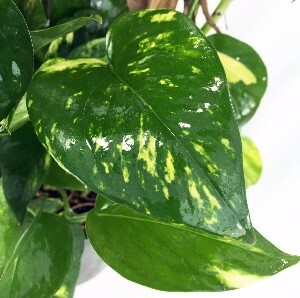 This group of plants includes a Golden Pothos, Parlor Palm, Flowering Peace Lily, and a Snake Plant (also called "Mother-in-Law's Tongue"), which is a fabulous low-maintenance plant. 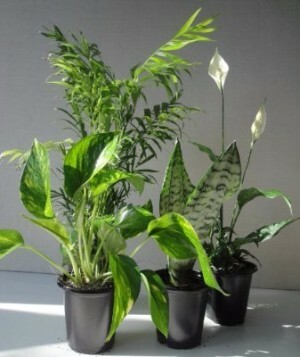 When I was decorating my home office, I got these four low-care, beautiful plants and they look great. While there are plenty of other indoor plants that are beautiful in offices, the 5 inexpensive options are the best office plants for folks who may not have a green thumb, but want the benefits of a beautiful work space with clean air.